Our workshops offer a deeper look into the many facets of Classical Yoga. Each workshop focuses on a different topic with our own teachers, as well as special guest teachers. Past workshops have included guest teachers Krishna Das, Sharon Salzberg, Swami Ramananda, and many more. Pre-registration is required for all events, unless otherwise noted. Celebrate our eight-year anniversary of Brooklyn Yoga School with this very special event: Sarah Tomlinson and Ambika are creating the Siri Jyoti Puja, a magical prosperity ritual. Increase your light, your radiance; your "Sri", your health and your wealth. Bring your positive intentions and watch them magnify and multiply with the Siri Jyoti Ritual. 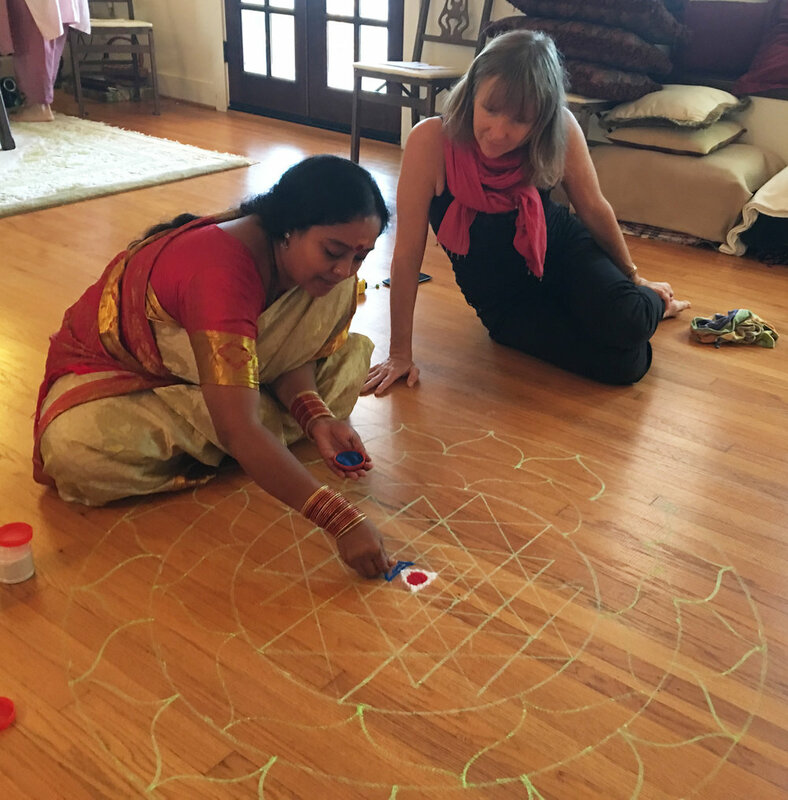 We will draw the sacred Sri Yantra on the floor then fill it with color and flowers, candles and love. A blessing ceremony with sacred mantras led by Ambika and a circle meditation will complete the ritual. 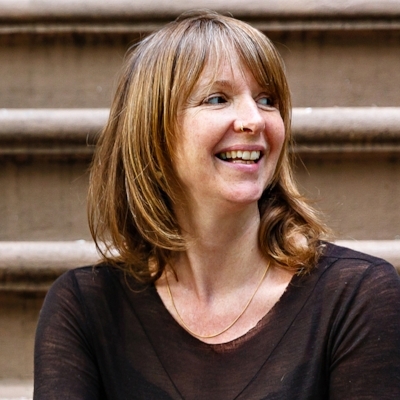 Sarah Tomlinson is an internationally acclaimed Yantrika (Yantra teacher and practitioner), yoga teacher and artist, with renowned fans across the globe including Elena Brower and Sharon Gannon, co-founder of Jivamukti Yoga. Sarah worked extensively with her mentor Harish Johari in India, he initiated her into the spiritual practice of painting Yantras. Sarah is the author of Coloring Yantras, Shambhala Publications, 2017, and Nine Designs For Inner Peace, Destiny Publishing, 2008, she has also self-published the Yantra Bliss Oracle Deck, 40 Exquisite Cards for Self-Healing. She leads retreats and Yantra workshops around the world and enjoys lots of time by the ocean with her husband and two young boys. Learn more via her website. Ambika has been a singer and musician for most of her life, playing in various bands in NYC until she discovered chanting with Krishna Das in 1995. Kirtan had a profound effect on her, and lead her to India where she met her teacher and Spiritual Mother, Shri Siddhi Ma. As Ambika deepened her connection to the practice of chanting, it became her home and refuge. Recently she has been exploring chants from other faith traditions, working with a program at The Cathedral of St. John the Divine. Her first full-length album, "Mother's Calling", produced by Lily Cushman, will be released March 23, 2018 on Mantralogy and is currently available for pre-order. For more information please visit her website. Cultivate the "Power of the Loving Heart" with Krishna Das, Sharon Salzberg, Lily Cushman and friends in the fifth annual Menla Mountain Retreat in Phoenicia, NY. Combining the complementary practices of devotional chanting, Lovingkindness meditation, and Classical Yoga, we come together to discover and celebrate the power of the heart in the beautiful Catskill Mountains. Through teachings, stories, chants, yoga and guided meditations, find your own inner knowledge and to open to deeper levels of courage and wisdom. Explore the dance of Shiva/Shakti through sacred chanting & healing yoga sadhana. Dr. Saraswati Markus specializes in the Dao Flow method: a unique blending of Yoga, Chinese medicine & Women’s health. Combined with devotional practice of Kirtan: call & response chanting of ancient mantra, led by Nina Rao. Awaken the authentic & nourish the feminine with two lifelong practitioners of the spiritual path. Join a celebration of chanting with Ananda Rasa Kirtan (David Estes) from the Bay Area and release party for Jennifer Mazzucco's illustrated Sri Hanuman Chalisa book! Books will be on sale at the event. A portion of the proceeds from this printing of this book go to the Love Serve Remember Foundation. Join Nina Rao to explore the bhakti practice of chanting the Hanuman Chalisa. This forty verse prayer sings the praises of the Hindu monkey deity, Hanuman. Nina will slowly teach the pronunciation and the deeper meaning of the prayer. Participants will also sing the prayer eleven times as a group. Word sheets will be provided. No chant experience necessary to attend. Join BYS Teacher April Frazier for an event of peace, love and play! Laughter Yoga is a joy-based stress relief program that cultivates playfulness in groups. Laughter yoga combines interactive laughter exercises with deep breathing and calming breathing. Join us at BYS for a special fundraising concert with J Mascis, Devadas, Tony Jarvis, and friends! The evening will include a variety of chanting, kirtan & songs. All proceeds from the event will be donated to Amma’s Embracing the World Charities. Come celebrate FIVE YEARS OF BYS. Join us for a birthday bonanza with delicious food, good friends, kirtan chanting, door prizes galore and a chance to win a $50 BYS class card! During the month of February, BYS is taking part in Sharon Salzberg's 28-Day Mediation Challenge. This is the third year that we have be a part of the challenge and this year our team is the largest to date with over 40 members (both teachers and students from the BYS Community). The challenge follows the 28-day meditation plan outlined is Sharon's book "Real Happiness" with elements also from "Real Happiness At Work". The yoga of writing is a process of revealing the truth in whatever form it wants to take – poetic, autobiographical, fictional or journal. Beginning and experienced writers alike will find a supportive, encouraging environment in which to write from the deepest self. Using the Amherst Writers and Artists Method, we write in response to prompts that are offered or we write by responding to whatever moves us. Join the Brooklyn Yoga School for our #MokshaChallenge on Instagram for the month of January 2015. Each day we will be posting a new asana photo of our teachers for you to photograph yourself in! Join us on the fourth Thursday of each month for a two hour yoga class taught by Katurah Hutcheson, featuring live music by Ilusha Tsinadze. Ilusha is an acoustic guitarist based in Brooklyn. For the class, he will be merging his meditation practice with his music, influenced by a long-standing love of Indian classical music. Class is an All Level practice, suitable for all students.